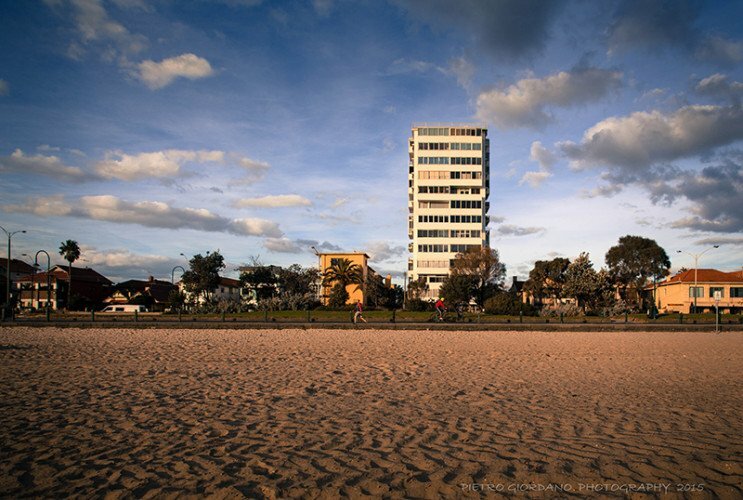 Edgewater Towers is a high-rise apartment block in St Kilda. The building, completed 1961, was Melbourne’s first, privately developed high rise apartment block and the tallest until Robin Boyd’s Domain Park Flats was completed in 1962. The building was opened by Sir Horace Rostill Petty, the Minister of Housing and Immigration. The building was designed by émigré architect Mordechai Benshemesh who designed many multi-storey buildings in St Kilda and Elwood. The original mid-century lobby features terrazo flooring, a curved stone wall and mosaic glass tiled columns. The Common area interior renovation was completed by Opat Architects in 2010-2014. What’s Open: A guided tour including Edgewater history, stories of the Architect and past notable residents. Two flats. A birds eye view of Luna Park. Fabulous rooftop panoramic views. Frequency Of Tours: Tours will run every 30 minutes with 10 people per tour. Queue at main entry point.